Shaiha's Ramblings: No more dropped calls with Verizon! I am sure that we have all been there. Need to make that important call but don't have a signal. Or having the connection be so slow that you can't download an app or a podcast. How incredibly frustrating! My moment of truth came about last summer when I was heading down to the Washington coast last summer. I don't have any kids of the two-legged variety but I do have some senior pets that I was worried about and wanted to be available to my pet sitter in case anything came up. And then it happened! Yep you guessed it. No signal. Thank goodness, a friend came along with us who just happened to have Verizon. If you have ever considered switching to Verizon now is the time to do so. 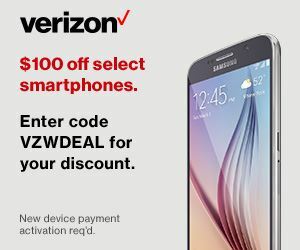 They’re offering waived activation fees for phones and tablets through June 11, plus $100 off select smartphones with code VZWDEAL. Now this is a deal that you are going to be wanting to jump on quickly as the $100 off select phones is only good through 6/30 and who wants to pay for activation. And speaking about the phones, Verizon has some of the best ones out there! I have fallen in love with the Samsung Galaxy 7 Edge. So much real estate on that screen. Be sure to check out all of their new deals here. I went out on Tuesday to a Verizon store to take a look at all of their new phones for myself and the dear husband. I tend to prefer the smaller phones so the iPhone SE is perfect for my needs. My husband prefers a larger screen as he watches a lot of movies and tv shows on his so I am trying to convince him that the beautiful Samsung is his best bet. That way I can at least admire it from afar. So which phone or tablet will be next in your life? Check out all the new phones here. Now to get you started, here is a contest for a Verizon gift card! Just think with the free activations, $100 off a smart phone and a $100 gift card, you can now get that phone that you have always wanted. There really isn't a better time to switch. And now for the disclaimers and restrictions. Waived activation available through 6/11; $100 off select smartphones available through 6/30. Both the waived activation and $100 off are available online only and cannot be applied to upgrades. $100 off select smartphones does not include the Samsung Galaxy S7 & Galaxy S7 Edge, HTC 10, or the iPhone SE.